Herbal teas are an excellent remedy for coughing and other ailments. They are soothing, warm and mostly non-threatening, even for children. Herbal tea is easy to make, and leftovers can be stored in the refrigerator to be consumed either hot or cold at a later time. 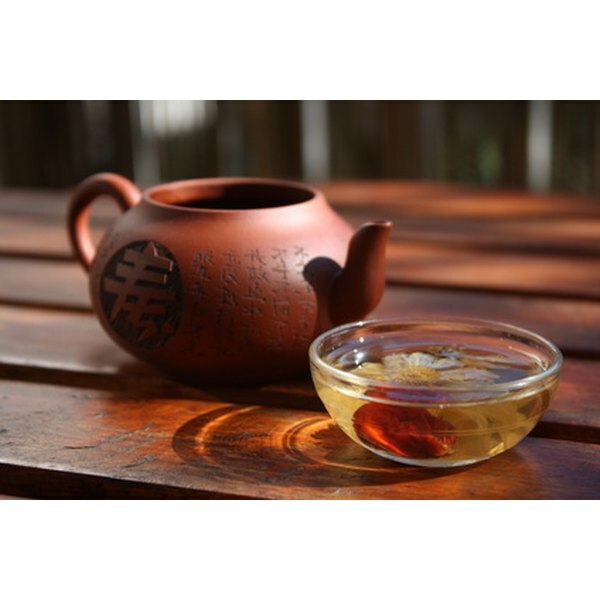 Although herbal teas are relaxing and curative, they can also cause side effects. Consult your health practitioner before using any unfamiliar herbs in any form. Making herbal tea is easy and quick and offers a simple way to receive medicinal benefits of herbs. Add the prescribed amounts of herbs, dried or fresh, to water and allow to boil for 5 minutes. Reduce the heat and simmer for the amount of time suggested by your practitioner or noted on the package. Remove the finished tea from the heat and strain. Allow it to cool. Some teas are naturally sweet, while others need sweetening added. The best sweetener to use for herbal teas for coughing is honey. Honey is a natural cough suppressant and soothes the throat, eliminating tickling and itching. If you would like to sweeten your tea, add a spoonful or more of honey. If you prefer, you can use that natural sweetener stevia for no added calories. Store leftover tea in the refrigerator and use later in the day. Drink it cold or reheat, but do not re-boil. Licorice root is used to relieve coughing that starts with tickling, itching or irritation in the throat or bronchial tubes. It stimulates the body to create a thin film of mucus, protecting sensitive membranes, according to “The Green Pharmacy Herbal Handbook." Licorice root tea should be made from dried herb or from prepared tea bags, which are available in health food stores. Licorice root tea also helps settle an upset stomach that may be the result of constant coughing. Licorice root can raise the blood pressure. Contact your health practitioner before using this herb. Marshmallow root was used by the Native Americans to treat upper respiratory tract ailments. The herb is especially helpful for relieving hard, painful, spasmodic coughing like whooping cough. Traditionally the Native Americans made a "tea" by boiling marshmallow root in milk or wine. In some cases, it was cooked and reduced into a cough syrup for the treatment of chronic and acute bronchitis, according to the Mississippi Valley Archaeology Center at the University of Wisconsin. A tea can be made by following the directions above and using water as the base. This herb can also be combined with other herbs to prevent coughing and cooked into a mixed herbal tonic that soothes and quiets most coughs. Consult your healthcare practitioner before using this remedy. Sundew is also used for many types of coughs, including spasmodic coughing from whooping cough to bronchitis. It is specific for the relief of bronchial coughs that start with a tickle or itching in the upper chest. Sundew makes an excellent tea, although it is somewhat bitter tasting. In this instance, honey will act not only as a sweetener but will also work in concert with the Sundew to relieve coughing. Consult you herbalist or health practitioner before using Sundew to confirm it is the best herb for your condition.